3 ‘go-to’ stocks starting to crack? While the banks have shown expected weakness, it is other areas of the market that have caught our eye as they start to lose their lustre after being strong for years. We look at 3 examples today, with all being quality businesses… but you have to ask: what price should we pay for the stock? 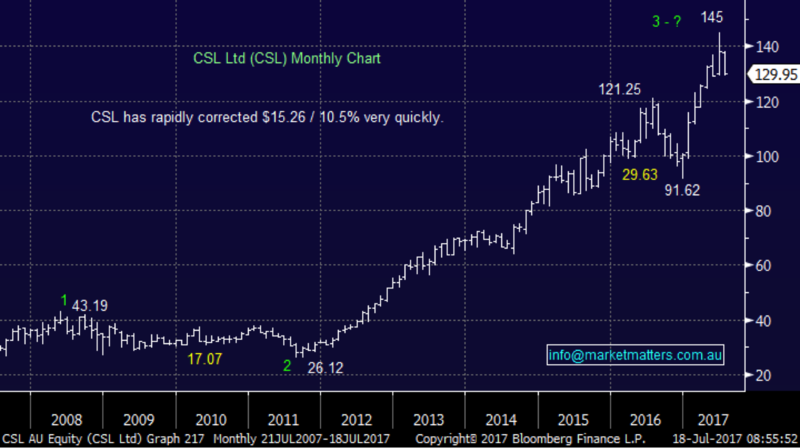 CSL has been an amazing performer for many years but when the stock surges over 50% this calendar year we have to question whether value remains. Over recent weeks CSL has rapidly corrected ~10% but it¹s still trading on Est. P/E for 2017 of 34x earnings which is very much at the rich end of town. With the US healthcare sector finally reaching our targeted area we are in the minority by going neutral / negative the global healthcare sector. While we may be a touch early with our 'sell' opinion we have been bullish for many years so when the sector hits our target we must evolve our outlook accordingly, however unpopular! 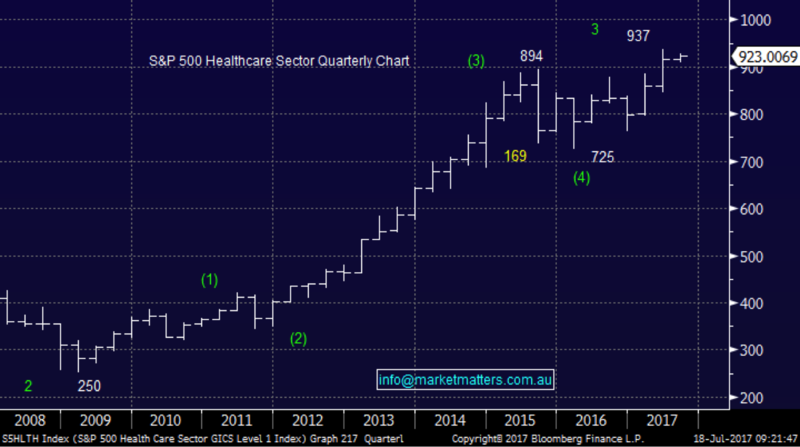 CSL and most healthcare stocks has felt a 'safe' place to park funds for Australian investors over recent years but the music always ends one day, the story was the same for CBA before it was hammered almost 30% in 2015. We continue to believe we will be able to buy CSL well below $100 in the next 2 years. TWE has enjoyed an excellent 3-4 years but the last 2-months has seen some clear profit taking with the stock trading on an Est. P/E of 31.6x for 2017 earnings. Similar to CSL investors have been comfortable allocating monies to TWE in 2017 at least not expecting to get 'hammered', a phrase we have heard a few times this year. 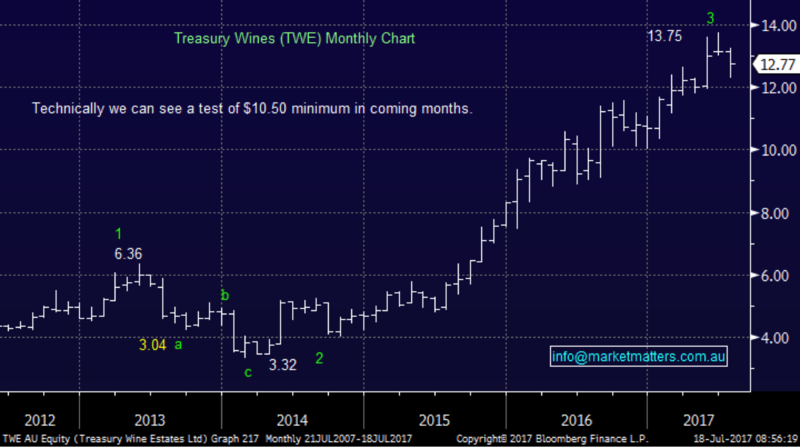 While we don¹t have the same conviction as with the healthcare sector our preferred scenario is TWE corrects a further ~15% towards $10.50. 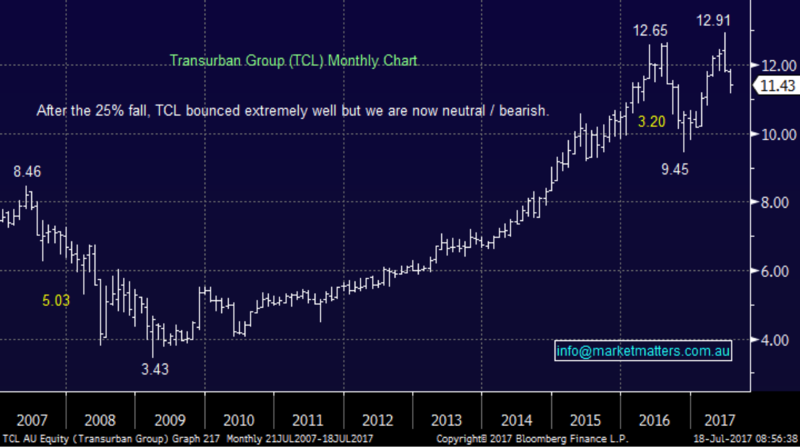 TCL has rallied ­ fallen ­ rallied like a trading stock not the conservative income producer most investors consider the stock to be. The issue is perceived direction of interest rates i.e. higher interest rates is bad news for the TCL share price. Our view is rates are going higher and the TCL share price is destined to fall back towards at least $10 ­ investors should not look for safety in numbers! We continue to believe that sector rotation will be a dominant characteristic in 2017 and investors should flexible and open minded. We are now bearish medium term the 3 highlighted 'popular' stocks today with the order of negativity TCL, CSL and lastly TWE. Investing with the crowd has been painful in the past, e.g. TLS and CBA, and we believe it will be again.